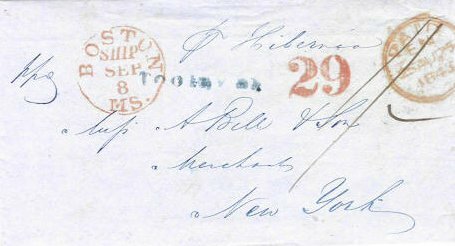 Prepaid letter from Tooley St., London, to New York via Boston on board Cunard's "Hibernia" leaving Liverpool 26th August 1848. Postage paid in GB: 1/-, red manuscript and London 'PAID' circular date stamp. The GB packet fee of 1/- for the first half ounce was introduced 10th January 1840. The retailatory 24¢ ship fee was charged by the US in response the the British Post Offices charges to mail carried by Ocean Line ships under US contract. The US Congress passed tha Retaliatory Act on 27th June 1848.